Our skilled, experienced and highly-educated dentists in Poland specialise in all forms of modern dentistry, including cosmetic reconstructions, teeth & tooth implants abroad, oral surgery as well as orthodontic, periodontic and endodontic dental work. This ensures that we are able to treat any dental problems that our patients might suffer from. Why opt for treatment abroad - and in Poland? Beat the soaring costs of dental treatments. The benefits of dental holidays. 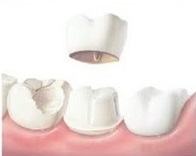 Dental implants are regarded as the best option for restoring missing teeth (single or multiple). They provide the longest-lasting solution to missing teeth, give a natural looking appearance and confidence to eat and smile. With such restoration, there is no need to drill the surrounding teeth, which is often the case with bridges and some dentures. Read more on teeth implants abroad. A tooth crown is an artificial restoration that fits over the remaining part of an earlier prepared tooth, making it strong and giving it the shape of a healthy-looking tooth. It is an ideal restoration for teeth that have been broken or weakened by decay or a large filling. 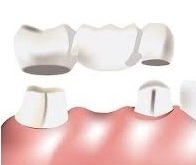 Dental bridges are made from porcelain crowns connected together to form a larger reconstruction which permanently replaces single or multiple missing teeth. Bridges are usually made of porcelain bonded to precious metal. Teeth veneers are ideal way to ensure chips, misalignments, gaps and discolorations are corrected. They are easy to apply and look very natural, due to their thin but strong structure. If you require cheap dental implants abroad or dental treatments which are not listed above, including fillings, whitening, dental braces, surgical procedures or other type of work, please contact us via email provided with the description of the problem. We promise to get back to you with more information.